Growing degree days since March 15 range from around 0 to more than 14. The growing season has begun throughout the Northeast and the Growing Degree days (GDD) are accumulating. This is a tool that farmers and gardeners use to track crop progress and to manage pest infestations. 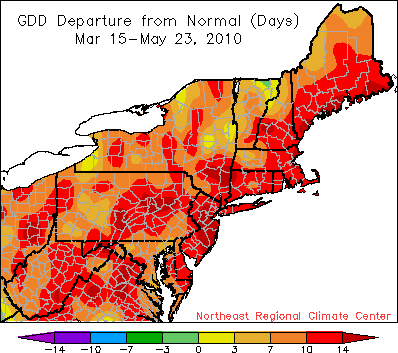 As the map above indicates, as of May 22, 2010, the GDD accumulation in most of the Northeast is 1 to 2 weeks ahead of normal. Most states in the region reported that field crop and fruit progress is ahead of normal. While it’s beneficial to get the field crops in early so the crop has time to mature, the early fruit bloom and emerging vegetables were damaged by the frost that occurred during the second week in May. The frost was considered a late frost in southern parts of the region, but well within the normal range for the northern states.